Kamut flour with bitter sweet chocolate and cranberries. Kamut flour with bitter sweet chocolcate, orange zest, and ginger. Keto gluten free bread using almond flour and flax meal. Yes, I am making genuine sourdough bread with organic ingredients. Click here for the menu of breads and prices. Order your bread 24-36 hours in advance directly from me, even for the group drop-off locations (sourdough is a long process). You pay me either in person, or by e-transfer to me if you pick up at a drop-off location. My house, 14895 Concession 6-7 Road, north of Berwick. South Nation Conservation in Finch, for people working there, on Friday morning. McCloskeys in Chesterville on Thursday evening. My ballroom dance class in Crysler on Monday evening. My ballroom dance class at the Benson Center in Cornwall on Wednesday evening. For people who work with Isabelle in Alexandria, on Friday morning. At the home of Denise Manley in Newington on Wednesday evening. But pay Denise in cash when you pick up from her. Did you really reduce or cut bread out of your diet? Think again. Here are ten reasons to love bread, especially sourdough. Bread is bread, right? Wrong! Not all bread is the same. Sourdough bread is the traditional levain bread that was common centuries ago before yeast was developed. Yeast was developed to make bread rise faster and give even predictable texture. So bread became industrialized and massed produced. Sourdough bread uses fermentation with naturally occurring bacteria and fungi. You could start your own culture in your own environment. It takes much longer to ferment and rise compared to yeast. So it is labour and time intensive. But the taste and texture are unbeatable. 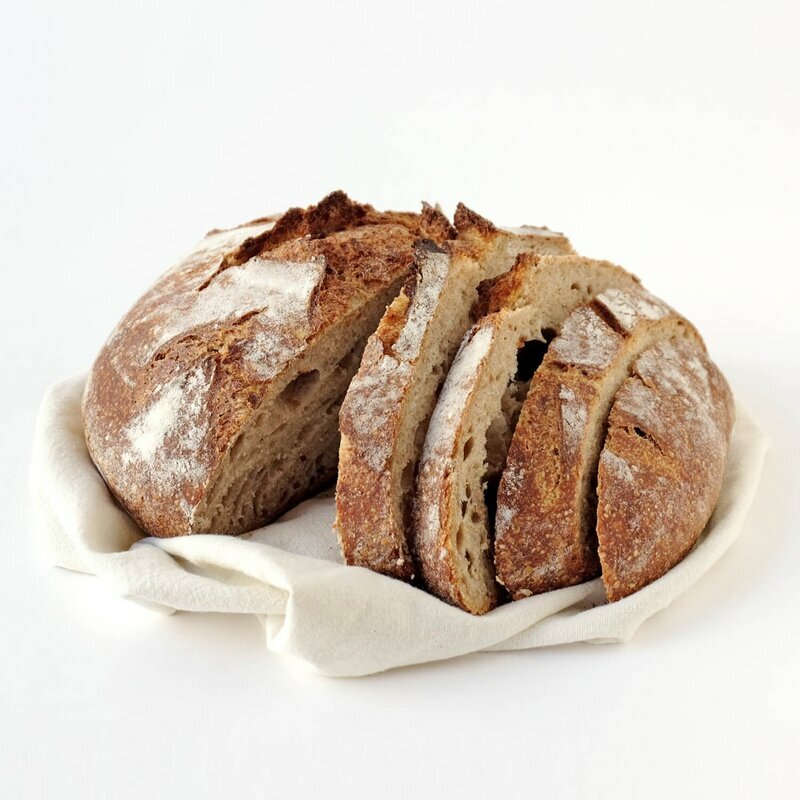 As the name says, sourdough bread has the sour taste of fermentation, like the sour taste of plain yogourt, and the sour taste of a good fermented beer. Secondly, the fermentation and the kneading give structure to the gluten in the flour, producing an elastic chewy texture. Tom's Pantry uses only certified organic flours. Most of the other ingredients are also certified organic. Look for the list of ingredients on the label to see which items are organic. But Tom's Pantry is not a certified organic operation. I will see about organic certification in the future as the business develops. The many species of wheat together make up the genus Triticum; the most widely grown is common wheat (T. aestivum). Bread flour is usually hard red spring wheat, whereas soft winter wheats usually go for pastries. Wheat is commonly produced in Canada and around the world. Wheat has the most gluten and causes bread to rise quickly. Spelt (Triticum spelta) is a species of wheat cultivated since 5000 BC. Considered an ancient grain, spelt was an important staple in parts of Europe from the Bronze Age to medieval times. It carries on today as a specialty health food in Europe and North America. Spelt gives a stronger but less bitter grain taste than wheat. Kamut, the branded name for Khorasan wheat (Triticum turanicum), is an ancient grain type. Khorasan refers to a historical region in modern-day Iran in the northeast and parts of Central Asia including modern-day Afghanistan. This grain is known for a cream colour, delicate texture, and rich, nutty flavor. Rye (Secale cereale) is a grass grown extensively as a grain, a cover crop and a forage crop. It is a member of the wheat tribe and is closely related to barley and wheat. Since the Middle Ages, people have cultivated rye widely in Central and Eastern Europe. It serves as the main bread cereal in most areas east of the French-German border and north of Hungary. Thanks to its strong taste, people appreciate the classic rye bread. Sourdough culture is a living dough sample kept every day and fed fresh flour for maintenance. Some culture is taken to make bread and the remaining culture is fed and multiplied for the next time. Culture is made by the fermentation of dough using naturally occurring lactobacilli bacteria and fungi. Sourdough bread has a mildly sour taste not present in most breads made with baker's yeast, and better inherent keeping qualities than other breads due to the lactic acid produced by the lactobacilli..
Next to its role in boosting the flavor of the bread, salt plays a role in tightening the gluten structure and adding strength to the dough. It helps the loaf to hold on to the carbon dioxide gas that is formed during fermentation, supporting good volume. Salt acts as a natural antioxidant in the dough and not only adds taste but especially helps bring out the flavours and aromas present in the flour and other ingredients. The classic white bread is a simple blend of sifted white wheat flour, water, salt and sourdough culture. Since white wheat flour has little taste of its own, the distinct sourdough flavour is most prominent. But white flour is high in carbohydrates, so consider some of the other flavours to add protein, fibers, and other nutrients to your bread diet. But take my statement with a grain of sea salt. Some sources claim that the white bread is not so different from whole wheat bread. As the nutritionist suggested, a whole wheat bread combines good taste with nutritional value thanks to the protein, fibers, bran, enzymes, and vitamins of the whole grain. I still use about 25% white wheat flour to give the bread extra volume, a lighter texture, and more air pockets. Try rye bread if you are getting bored with whole wheat. Rye bread offers a sharper taste and denser texture than wheat, along with very amazing health credentials including slower sugar uptake during digestion, more magnesium, and more phyto estrogen. I still mix 25% white wheat flour in my rye bread recipe to lighter the taste a little and give the bread more volume. Kamut (pronounced ka-moot) is a trademarked name given to khorasan wheat. The grain had been all but forgotten, but in recent history Kamut is making a comeback. This is most likely because of its great taste, texture, nutritional value and hypoallergenic properties. Even when milled as a whole grain, the bread colour is very light, the texture is soft, and the taste is slightly nutty. The many health benefits of spelt flour are responsible for its current comeback. Spelt aids blood circulation, boosts the immune system, builds strong bones and aids digestion. Spelt is similar to wheat but has a slightly stronger grain taste and a darker colour. Read more about the health benefits. Let's put is all together to combine the flavours and benefits all these grains. I mix white flour with whole wheat, whole spelt, whole kamut and a touch of whole rye flour. When I travelled (twice) to Egypt years ago, I fell in love with the antiquities, the people, and the artisanal pita bread, called AISH BALADI in Egypt. The pita in Canada is a flat bread like a tortilla from fast industrial production. So I learned to make sourdough pita at home, the Egyptian way with good texture, good weight, and a great taste. I told a local shawarma restaurant owner that I make sourdough pita at home, and she piped up immediately: "Yes, it is so good, like the real pita!" Ciabatta is an Italian white bread made from wheat flour, water, olive oil, and salt, created in 1982 in response to the popularity of French baguettes. My version is a small rectangular bun. You can cut the top half off to make a sandwich. It has a great taste and chewy texture. Ezekiel bread is a traditional grain using whole sprouted grains and legume flours. Read more here. I make an Ezekiel style of bread by following the same recipe, except that my flours are not from sprouted grains and I use four legume flours (black beans, green lentils, chick peas, and soybeans.) The texture is wonderful and the taste is great. The ketogenic diet (or keto diet, for short) is a low-carb, high-fat diet that offers many health benefits. Read more here... Being low-carb, people avoid bread made from cereals. So I found a Keto bread recipe that does not use cereals, so it is also gluten free. We use almond flour, flax meal and eggs for protein, and various fibers and ingredients for textures. This is not a sourdough bread as it needs yeast to rise. I wrote gluten free as defined by the recipe, but my kitchen still handles cereals, so beware of a low risk of unintentional contamination. This chewy French baguette is a classic white sourdough. The combination of the sourdough method with milk instead of water gives the bread an extra sour taste and lovely texture. Crispy on the outside and soft on the inside is what the chef ordered. organic oregano herbs and organic sundried tomatoes. organic raisins, white almonds, and a touch or organic cinnamon. bitter sweat chocolate and cranberry in Kamut flour. bitter sweat chocolate with orange zest and ginger in Kamut flour. the round artisanal loaf with or without the circle pattern of flour on the top. the traditional loaf pan shape. Sourdough bread has so many advantages. The taste is great, compared to the lain sweet taste of commercial bread with yeast. The texture is chewy elastic, and does not fall apart, making it great for sandwiches and dips. Not only does live culture improve the flavor, but the bread stays fresh after baking, much longer than factory bread and doesn’t require any extra preservatives to ward off mold. Sourdough is a fermented food, similar to sauerkraut, kefir, pickles, and kombucha, by using lactobacillus cultures (a probiotic, aka bacteria that benefits your gut). The fermentation produces lactic acid, and that does the body a whole lot of good. Lactic acid helps decrease the levels of phytic acid in bread (phytic acid interferes with the absorption of certain nutrients, which is a bad thing). This in turn, helps other nutrients become more readily available, digestible and absorbable. The carbohydrates and the starches in commercial breads are quickly digested. This produces a high glycemic response, meaning that your blood sugar spikes quickly after eating. But the fermentation process in sourdough lowers the glycemic index and makes it a great low GI bread. How do I preserve my loaf of sourdough bread? Sourdough bread keeps very well thanks to the fermentation process, the low PH of the dough, the high cooking temperature, and the freshness. Keep the loaf in the plastic bag for up to a week. As the days pass, the loaf may dry out slightly or become stiff. Just drop a slice in the toaster briefly and bring out the crispness, the elastic texture, and the flavour. Sourdough bread freezes very well. Thaw it out on the counter in the bag, drop a lice in the toaster briefly. No. We still use glutenous grains: wheat, kamut, spelt, rye. The fermentation does not remove the gluten. So a celiac person must still avoid sourdough bread. What if I am sensitive to wheat? Sensitivity to wheat is a digestion problem, not an allergy. Fermented foods help with digestion - read more here. I have heard people tell me that they are fine with sourdough bread whereas they have problems digesting commercial breads. Is Tom's Pantry an inspected kitchen? No. I make bread out of my home kitchen and it is not inspected by the regional public health officer. Nevertheless, I took the course on safe food handling and I have implemented the food safety measures as best I can in the context of a home kitchen. What allergies should I be concerned with? As my kitchen is in the house, we have to deal with our home environment. We have a dog in the house. We eat other foods so there are allergens in the house. But I apply good sanitation and segregation to reduce the risk of cross contamination. When preparing sourdough bread, we do not use dairy products (except the cheese flavouring in specific cases), eggs, seafood, shellfish, soy, peanuts.